Haunted Hearts is the third release from Vermont's Oleo Romeos. As front man and guitarist Tyrone Shaw writes in a note to Seven Days, the album comes "a mere seven years" after their the group's sophomore release, Check Please. Despite that lag, it doesn't seem like too much has changed for the Romeos. Shaw still handles the bulk of songwriting duties, with guitarist Jerry Bowers chipping in. Bassist Will Patton manages the low end with reliable flair rivaled only by his mustache — and the steady beats of drummer Roy Cutler. Doug Southworth fills the spaces with tasteful organ, piano and accordion licks. As on Check Please, welcome guests abound on the new record. These include Patton's daughter, Anna Patton, on clarinet, backing vocalist Nate Orshan, guitarist George Lewis, bassist Casey Dennis and drummer Caleb Bronz. But most importantly, the Romeos' brand of swingin', twang-inflected R&B remains perfectly intact and playful. That's primarily a credit to Shaw, whose easygoing songwriting style is slyly humorous and gently offbeat. However, where the Check Please harked back to a more innocent bygone era of roadside diners and swing clubs, Haunted Hearts takes a detour to the shadowy juke joints just off the main drag. As the comic-book-inspired cover art depicting a lecherous drunk, a bored baby doll and a mysterious stranger suggests, the album is darker, but cartoonishly so. Flush with tumbling slide guitar, opener "Might Get Lucky" sets the record's woozy, lascivious tone. Put Daft Punk's "Get Lucky" in Doc Brown's DeLorean and send it back to 1955, and you'll get the idea. "When you opened up your door / I had to smile at what I saw / Your big blue eyes were gleamin' / The pots were over-steamin' in the soft light. / If I read the situation right / I might get lucky tonight," sings Shaw in a sort of loose, "aw, shucks" baritone. It's fun and kinda goofy. But things soon turn moodier. "This Haunted Heart" takes sonic cues from Ray Charles' classic Modern Sounds in Country and Western Music. Shaw is no Charles, of course. But the melancholy number borrows the tone of that record's fusion of soul and C&W. "I Know a Guy" is the gloomiest number on the record, as Shaw counts the many ways he'd like to dispatch a love interest's abusive, wealthy husband. "You're standing in the doorway / in that torn-up summer dress / I see the bruises / your eyes tell me the rest," he sings. Then, "I suppose you could press charges / With his bucks they won't stick / Why don't we kill that prick?" The record stays on a darker path. "Has It Come to This?" laments corruption and apathy in modern society set to a contrasting island boogie. "Waiting On Your Love" puts the listener on a barstool smoking cigarettes and drinking whiskey in the glow of a neon sign, waiting on a lover who never shows. The album closes on the mysteriously dark "Klezbollah," a hybrid klezmer-surf number with a murky lounge feel that wouldn't seem out of place in a David Lynch flick. 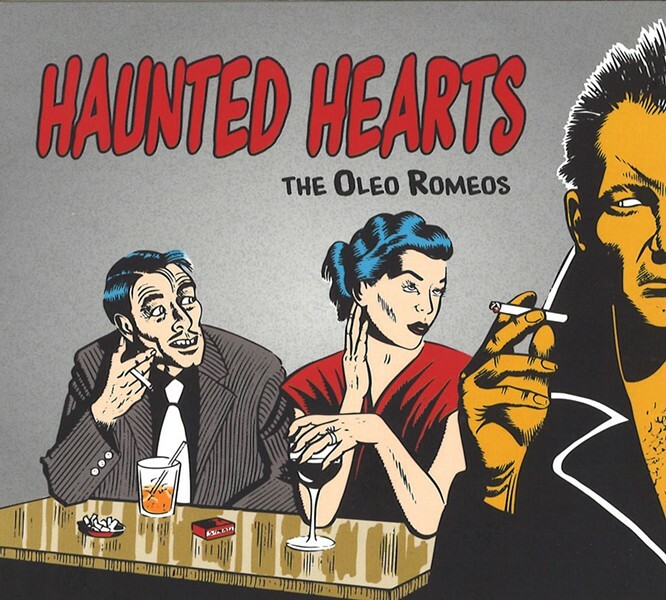 To order Haunted Hearts by the Oleo Romeos, email theoleoromeos@gmail.com.